Besides the $5.7 million in K-12 aid, Kittleman also asks Hogan to restore about $900,000 in aid to Howard Community College and about $45,000 to the library system. Kittleman acknowledges in the letter that Howard County is one of the richest jurisdictions in the state, but that "it would be disappointing to not be able to maintain some of our crowning achievements." I don't believe this letter is online, but should I find a copy I will be sure to share. While $189 per pupil makes sense to party wonks and education advocates, it is meaningless to the average voter. For the most part, Marylanders are skeptical of "government math" and will attribute any unassigned dollar to waste. If this argument had been structured to say that Maryland students will be required to use out-of-date textbooks or class sizes would increase (a dubious argument to make without clarity on how these cuts will trickle down to the classroom), Maryland parents would probably pay attention. But so long as you throw around "$189 per pupil! Per pupil, do you hear me! ", this is just noise. 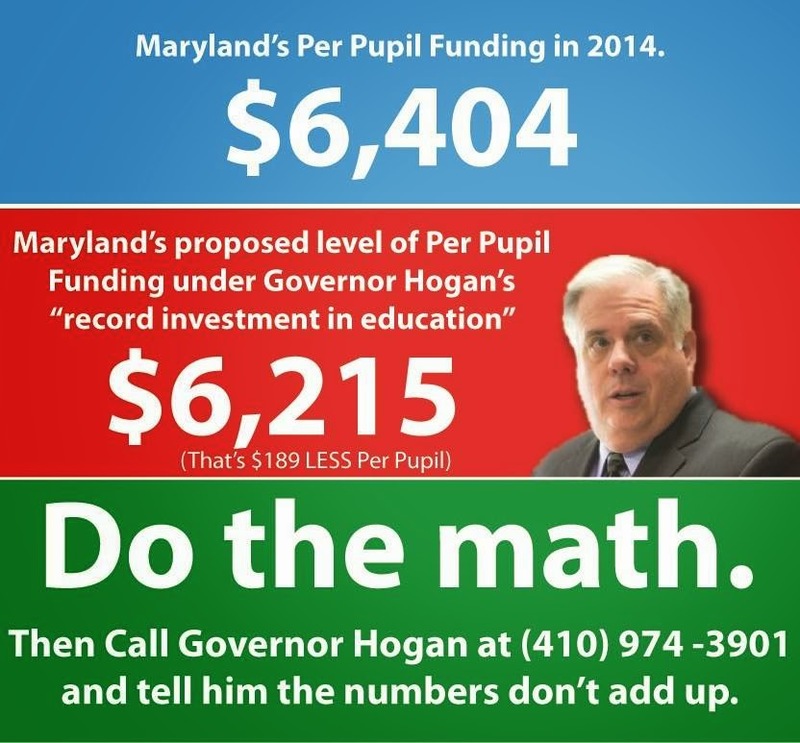 But then comes a Republican County Executive to confirm that a) Hogan's budget cuts education, and b) these cuts will hurt performance. That changes the conversation. The very convenient Republican shelter of "these really aren't cuts...don't believe those crazy Democrats who taxed the rain" falls away and we start to talk about what happens when government tightens its belt. While we may all find common ground in the need to do so, we also need to agree that less money means less service. And on that point, Kittleman's confirmation that the failure to continue funding will interfere with our ability to "maintain some of our crowning achievements" is putting the albatross on Hogan's neck. "Don't look at me, folks. I tried to get our Governor to help us out, but he shut me down." Brilliant political maneuver for what will become a series of rock-and-a-hard-place decisions on what County Executive Kittleman is willing to cut. I'm glad our County Executive is pushing back against the "no cuts to see here" nonsense, but am suspect of a letter between two guys who I presume to be texting-buddies. Is this the first step in a fight to protect funding for Howard County students? Or is this political cover? ADDENDUM: Worth noting that County Executive Kittleman met with Budget Chief David Brinkley after sending the letter, indicating that this is the first step in an ongoing dialogue. Have a great Friday doing what you love! It's impossible not to.